By Gordon Hoffert, Joe’s son and a member of the preaching team at the Lewiston Church of the Brethren. 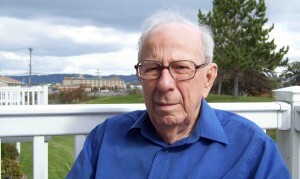 Joe passed away on December 20, 2012 at the age of 91. I spent many years next to Joe Hoffert in a church pew sharing a hymnbook and singing. Together we sang hundreds of hymns. As I learned more about music – notes on the scale, accompanying instruments and singing voices – I became aware that my dad didn’t sing the same tune that everyone else was singing. His high notes didn’t reach high enough. His low notes didn’t drop low enough. The notes in the middle didn’t seem to land in the right place, either. I’ve heard theories that anyone can carry a tune if given proper instruction, that there is no such thing as “tone deafness.” I’m here to tell you, those theories don’t hold water. Phrase it any way you want, my dad was musically challenged. He was an educated man, an educator himself. But I think even the greatest vocal instructor would have failed him as a teacher. I’m not sure when my mother, a gifted musician, gave up trying to help him improve his singing, but I have a sense it was early in their relationship. And it’s not as if my dad didn’t understand the theory behind the notes on the scale. One time while singing a hymn, I decided to listen to his voice while following the notes. Sure enough, when the notes climbed, so did his voice. When the notes descended, so did his voice. But he had so few notes in his vocal repertoire that a direct hit was rare. Still, I never once heard him apologize for his singing. There were times I had to stop singing myself to suppress the laughter that welled up when we got to “Trust and obey…” I’m sure he recognized what was happening when my head and shoulders would start bouncing up and down with no sounds escaping my clenched teeth. But he never scolded me. In fact, it never seemed to bother him that his tune was in flagrant violation of the song’s key. Alas, my dad was a patently awful singer, but, at the same time, he was a passionate singer. I suspect that as some singers are moved by melodies and harmonies, since he didn’t hear them, my dad concentrated on the message. Hymns are first and foremost vehicles for proclamation, instruction, and prayer. He wasn’t distracted by the need to hit the right note, but he did need to get the words right. And when they came out of his mouth, you could tell that he understood them and meant them. “…for there’s no other way to be happy in Jesus, but to trust and obey.” He sang those words with abandon. That, to him, meant singing in perfect pitch.